Jubilee at Hawks Prairie continues to be a hit for active adults looking to retire near Seattle. Nature lovers should look no further than Jubilee at Hawks Prairie for their perfect 55+ community. Situated at the southernmost tip of the Puget Sound region, active adults will fall in love with the hundreds of hikes available to them within just a few short miles, the breathtaking landscapes, and the thrilling culture of nearby Seattle. Retirees will also love the lack of income and pension taxes in the state of Washington, making for an affordable place to put down new roots. Jenamar began construction on Jubilee at Hawks Prairie in 2004, but the community was later acquired by Shea Homes in 2010. Upon completion, this community will have 944 homes. While this community was already impressive, the latest acquisition by Shea Homes has only added to this community’s desirability. At Jubilee at Hawks Prairie, you will find a beautiful selection of both new and resale homes, with five different collections to choose from: Villa, Cottage, Coastal, Estate, and Shea3D. Buyers can also find 13 different floor plans from the previous builder, Jenamar. The Villa Collection offers two floor plans ranging from 1,285 to 1,386 square feet, both with two bedrooms and two baths. The Cottage Collection also offers two different floor plans with two bedrooms, two bathrooms, and ranging from a slightly larger 1,500 square feet to 1,617. The five distinct floor plans of the Coastal Collection range from 1,586 to 1,922 square feet and offer two or three bedrooms, two bathrooms, and a great covered patio. With the largest homes, the Estate Collection offers three floor plans, ranging from 2,180 to 2,445 square feet, and with two bedrooms plus den and two-and-a-half baths. The Shea3D Collection offers two models that range from 1,863 to 2,132 square feet of living space, two or three bedrooms, and two or two-and-a-half bathrooms. All styles in Shea Homes' collections offer two-car garages, covered patios, and some have the option of adding on an additional patio space. Before Shea Homes took over, Jenamar Homes offered 13 distinct floor plans, ranging from a cozy 1,277 to a grandiose 2,584 square feet, two or three bedrooms, two to three bathrooms, and attached two to three-car garages. The Jenamar homes are available for resale purchase only. While the home offerings in this community are spectacular, the amenities at Jubilee Hawks Prairie are surely what draw home buyers in. Residents can venture over to the 26,000 square-foot Jubilee Lodge, where they will find a variety of amenities to suit their active adult lifestyle. Features include a state-of-the-art fitness center, an arts and crafts studio, hobby and game rooms, billiards, a coffee bar, and more. Additionally, outdoor fanatics will go wild over the two 18-hole golf courses in the community, tennis courts, pickleball courts, various trails, and the private beach access. Accompanying the many amenities offered at this luxurious community, homeowners can also expect to find several different social activities and clubs to keep their social life booming. Neighbors can choose from activities ranging from bingo to chorus to Mah Jongg. Not to mention the wide array of outdoor clubs including a tennis club, men's and women’s golf, and hiking club, just to name a few. Boredom is certainly not an option at this lively, sociable community. 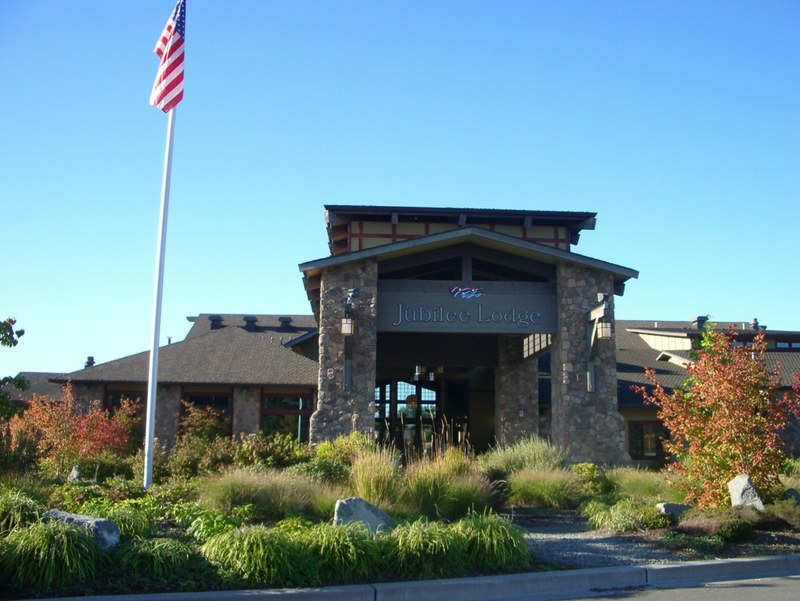 Jubilee at Hawks Prairie is nestled nicely next to preserved forest space, and within the city of Lacey, a suburban community just five miles outside of Olympia, WA, and 58 miles from greater Seattle. Being so close to two major metropolitan areas, Jubliee at Hawks Prairie is surrounded by an abundance of restaurants, shopping, and cultural attractions. There are also several grocery stores within five miles and Providence hospital is just six miles away for your peace of mind. With beautiful homes, a world-class assortment of amenities and activities, and seemingly unlimited access to breathtaking scenery, Jubilee at Hawks Prairie is the perfect place to call home.